Keeping a pet bird can be a joy, and half the fun is shopping for accessories that both enhance your pet's lifestyle and provide convenience and savings for you. With some product suggestions and information, you'll be well on your way to selecting the right accessories for your feathered friend. Every bird owner knows the greatest challenge in keeping a pet bird is containing the mess from seeds and shells flung out of the feeder. No mess-type feeders can greatly reduce the mess, as well as the waste, of perfectly good seeds. 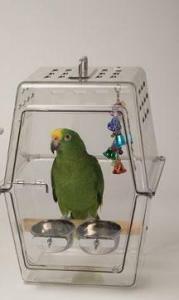 Tidy Seed Feeders are clear acrylic, box-shaped feeders that have a recessed area to hold food while the walls contain the majority of the mess from winding up outside of the cage. These feeders come in sizes from small through large, and prices range from about $22 to $150 depending on the size chosen. While that may seem expensive compared to the average feeder cup, the cost is worth it in the long run when you compare it to how much you'll save on wasted food. Caitec's Seed Corrals are similar to Tidy Feeders, but they're less expensive. They come in small or large sizes and run around $14 to to $35 depending on the size chosen. Customers give the product an average rating of 4 out of 5 stars, so this might be a more reasonable option for price-conscious shoppers who want to try this type of feeder before making a larger investment. The benefits of clean drinking water are immeasurable, but birds can really make a mess out of their water dishes. They bathe in their drinking water, toss food in it, and even poop in it. If you want to ensure your pet has a clean source of drinking water, you need to provide him with a water bottle. Lixit glass water bottles are available in varying sizes, and you can get different size drinking tubes to accommodate the smallest and largest birds. Glass bottles have an advantage over plastic bottles because a bird can't chew through the bottle if he's able to reach through the cage bars. 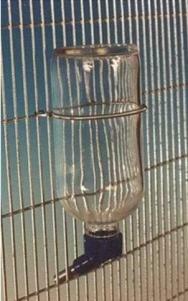 Simply fill the bottle with fresh water every day, and hang it on the outside of the cage with the drinking tube extended through the cage bars. It's usually best to hang the bottle over the existing water dish and watch to make sure your pet has learned to use it before you remove the standard dish. Prices begin around $36 for a 16-ounce bottle kit. 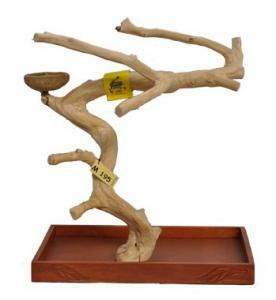 Java tree stands offer birds a natural place to perch and play when they're out of their cages. These stands are made from the wood of coffee trees that no longer produce, and no two stands are exactly alike. They are highly durable, and the varying widths of the branches provide good exercise for your pet's feet. Since this is a natural product, sizes and prices vary. You can expect to pay anywhere from $30 for a smaller tree, to up to $800 for a large tree. Trees generally come with a wooden base and an eye screw for hanging toys, and larger models may come with casters and at least one food cup. Birds should bathe several times a week, if not daily, to keep their feathers in the best condition. A shower perch can help provide the ultimate bathing experience. The Sandy Shower Perch is a fold-out perch that can be attached to a smooth shower wall with the accompanying suction cups. Simply fold it down for your pet to use and then fold it up when she's finished. The perching surface is textured to provide a firm grip for her feet. 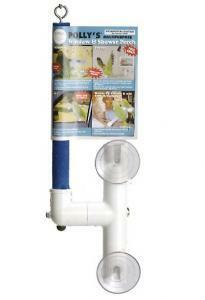 Customers give the product great reviews, and the price runs around $16 for a small shower perch. A large perch is priced around $20. Most bird owners would love to spend time cuddling with their pet, but they just don't want to get pooped on. A flight suit can solve that problem. 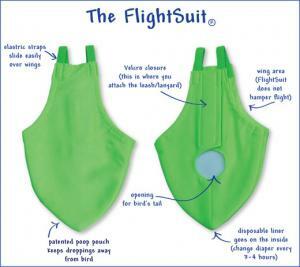 FlightSuits are made from breathable fabric, and they have a small pouch that rests just beneath a bird's vent that collects that pet's droppings and keeps her clean. The pouch holds a small liner that keeps the droppings from soiling the suit, so all you have to do is change the dirty liner for a fresh one. If house accidents are the only thing keeping you and your bird apart, a FlightSuit just might be the answer. These suits come in a variety of size and patterns, so pricing varies. A basic starter/training kit with one suit and a package of liners costs about $16 whether you need a petite suit for a lovebird or a colossal one for a macaw, and Flightquarters offers a sizing chart that will help you select just the right fit. While it's nice to take your bird outside for sunshine and fresh air, you run the risk of losing him if he's not in a cage. With the proper harness and leash, you can give your pet some free-flight time without having to worry about him suddenly flying off. 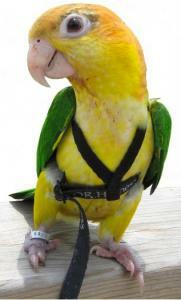 The Aviator Harness and Leash slips over your bird's head and wings and is then adjusted to fit snug at his waist. The leash is elastic, so it has some give that lets your pet know he has reached the end of his tether without experiencing a harsh jerk. Sizing runs from petite to extra large, and the price is about $30 per set regardless of the size chosen. Customers rate this product around four point five out of five stars. Caution: While the harness can prevent fly offs, it can't prevent a hawk from grabbing you bird. Keep a close eye on your pet at all times and take him inside if you notice a hawk in the area. Most pet birds are comfortable in the same living environment as their owners as long as they aren't in a drafty space. However, they do appreciate a little extra warmth sometimes when it's cooler, when you're running the air conditioner, or when they don't feel well. 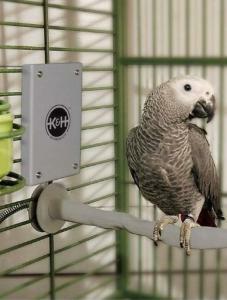 The K&H Snuggle-Up Bird Warmer is a low voltage metal warming plate that can be attached to the side of your pet's cage to provide ambient heat. Think of it as a heating pad attached to a wall. You can adjust the temperature via the unit's thermostat, and the unit's cord is wrapped in wire to keep pets from chewing through it. Place the heater next to one of your pet's perches, but be sure he has enough space to move away from the heater when he doesn't need it. Pricing runs between $30 to $35 depending on the size of the heater. The product receives just over four out of five stars from customers. The K&H Thermal Perch is another warming option which provides a gentle source of warmth for your bird's feet. Like the Snuggle-Up, its cord is wrapped in wire for safety. Use this as an additional perch in your pet's cage so she can perch elsewhere when she feels warm enough. Pricing starts around $30 and sizes vary. Customer reviews give this perch 4 out of 5 stars. 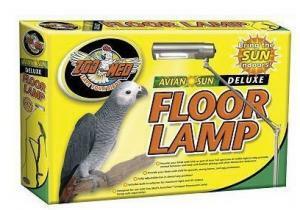 The Zoo Med Avian Sun Deluxe Floor Lamp provides full spectrum UVA/UVB light that helps birds synthesize vitamin D3 which is needed for them to metabolize calcium so they can grow strong bones and produce strong egg shells. It's adjustable, so you can set it at just the right angle for your pet's cage. Customers give this lamp four point six out of five stars, and the price is just over $30. The bulb must be purchased separately at an additional cost of about $21. A travel carrier comes in quite handy when your bird needs to go to the vet or groomers. 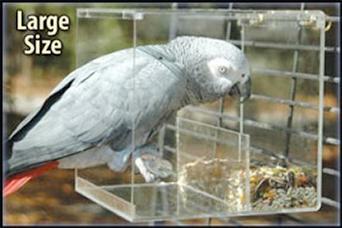 The Wingabago Carrier is made from durable, food-grade plastic and offers a clear view for birds. This carrier is lightweight, ventilated, and has a handle on top. Each carrier comes with three different perch sizes, which is great if you have different size birds and need to switch perches to accommodate them. The carrier also comes with bolt-on metal cups, and a toy hanger. The small carrier measures 12 x 12 x 17 inches and costs about $200. The large carrier measures 15 x 15 x 22 inches and runs about $220. According to My Safe Bird Store, some veterinarians feel birds are less stressed when they can see their owners, so this clear carrier can be a good option. Birds like to be covered at night to feel more secure, and they need about 12 hours of sleep each night to help keep them healthy. While it's easy to cover a small cage with a light blanket, covering a larger cage isn't as easy. Good Night Bird Cage Covers are made from breathable, non-toxic material that shuts out the light to give your pet a good night's sleep. 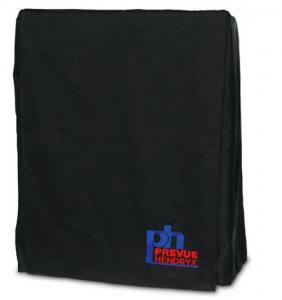 The medium size cover fits cages that range from 18 x 18 x 24 inches to 20 x 20 x 30 inches and is priced around $25. The large cage cover fits cages up to 36 x 24 x 44 inches and is priced around $30. Customers give these covers a solid five out of five stars. The cost of all these accessories can add up quickly, but there's no reason you have to purchase them all or even purchase them all at once. Decide what's most essential to your pet's health and happiness and base your purchases on that. In time, you'll accumulate a variety of accessories that will give your bird a better quality of life.